The TVR as it was known, began life in 1840 as a direct result of the opening of the first Bute Dock at Cardiff. At the time, the Glamorgan Canal (opened in 1794) stretched from the iron works at Merthyr to the sea at Cardiff and was used for bringing iron and coal to waiting ships. But it was clear that with the new dock opening, the canal was not going to be able to cope with the expected increase in freight traffic. The first section of the Taff Vale Railway from Abercynon to Cardiff was built by Isombard Kingdom Brunel and opened on the 8th October 1840. In June the following year regular traffic on the TVR began linking the dock all the way to the coal and iron industries of Merthyr, a distance of some 25 miles. A speed restriction of 12 mph was placed on the railway which was financed, owned and operated by the ironmasters themselves as a means of exporting iron efficiently to all parts of the UK and overseas. In so doing, it made Merthyr the biggest iron exporting town in the world at that time. From the beginning, there was an uneasy relationship with the Bute Dock Company and this led eventually to the Taff Vale Railway Company building their own rival docks at Penarth, which opened on the 10th June 1865, less than five miles away from the docks at Cardiff. In turn, though much later, the Bute Dock Company built their own railway line to the coal mine at Nantgarw, 9 miles north of Cardiff, and renamed themselves the Cardiff Railway Company. This line opened in 1910 but it was never a commercial success and closed again some twenty years later. In 1922, a major amalgamation of Britain's railways took place and the TVR and Cardiff Railway were both absorbed into the Great Western Railway. The Bute Docks at Cardiff were making a loss by that time and they were sold to the GWR for five pounds. In the second half of the 19th century many railway and dock companies organised their own police forces, as they were entitled to do by act of parliament. In Cardiff, as well as the Cardiff Borough Police and Glamorgan Constabulary policing the outlying districts, there also existed the Taff Vale Railway Police, the Rhymney Railway Police, the South Wales Railway (later GWR) police, as well as the Bute Dock Police and Glamorgan Canal Police. The earliest known TVR railway policeman is Pc George Shapland who is mentioned in a newspaper report of 10th January 1846. He is followed by Pc Henry Litson on the 31st March 1849. 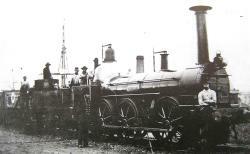 Pc John Wallbridge appears on a photograph believed to have been taken in 1849 or 1850 standing alongside the TVR locomotive ‘Newbridge’. It may represent the earliest known photo of a steam locomotive anywhere in the world and is almost certainly the earliest known photo of a British railway policeman. Officers of the TVR did not wear a uniform until at least 1849. A newspaper report of 27th January 1849 reports that the TVR police Superintendent had recently adopted a uniform and the whole force would soon follow as ‘an official costume invariably adds much to a man’s authority’. 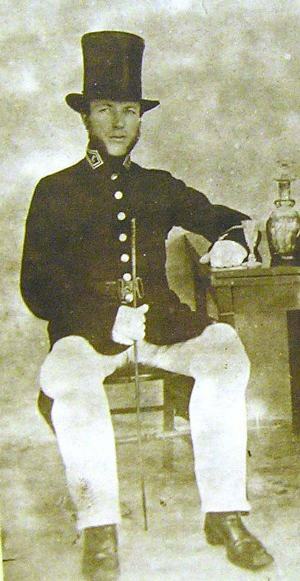 In 1858, tailor George BIRD was in charge of the issue of uniforms to the Taff Vale Railway police. Bird had previously been uniform tailor to The Cardiff Borough Police and The Bute Dock Watchmen. The uniform included a frock coat, one pair each of blue cloth and white cotton drill trousers, a stock (cravat) and a top hat. At the time (1858) the force had at least sixty four officers. One of these, Police Constable No. 12, Thomas VENN, was stationed at East Branch, close to the north end of the new East Dock. Venn appeared at Cardiff Police Court on the 2nd. of October 1858 charged with neglect of duty having failed to prevent a collision between trains. He was convicted and fined 40 shillings and ordered to pay costs, with an alternative sentence of 14 days in prison. He was not the first railway policeman to face charges, on the 24th January 1857 John Poynts a policeman and pointsman with TVR at Danyderry, was charged with neglect of duty by being absent from his post. And a TVR constable was the first officer on the scene of the murder of Timothy Harrington whose killing was one of the first recorded murders to take place at Cardiff docks. On the night of the 27th December 1851, Pc George James was on duty at the East Branch when just before midnight he heard the voice of a man calling for help. Pc James found a man on his hands and knees calling out in pain. The man told him that “A Greek has stabbed me” and there was a pool of blood on the floor. The victim was unable to walk and Pc James was greatly alarmed at his condition; he went to seek help. In Bute Street he met Pc Wallbridge and two other constables Dean and Rees. The officers returned to the scene and found the victim just a few yards from where James had left him. Harrington was taken to the infirmary where he died some nine hours later. Two seamen, a Swede named Gabriel Gibson and an Irishman named Richard Keenan were later arrested and charged with the murder. Both men were employed in the American Maritime service and they were sent for trial at Glamorgan Assizes. TVR policemen also policed Penarth Docks after they opened in 1865; having been built by the Taff Vale Railway Company. But, in common with many smaller dock and railway forces, the force disappeared after it was absorbed into the Great Western Railway Police in 1922.